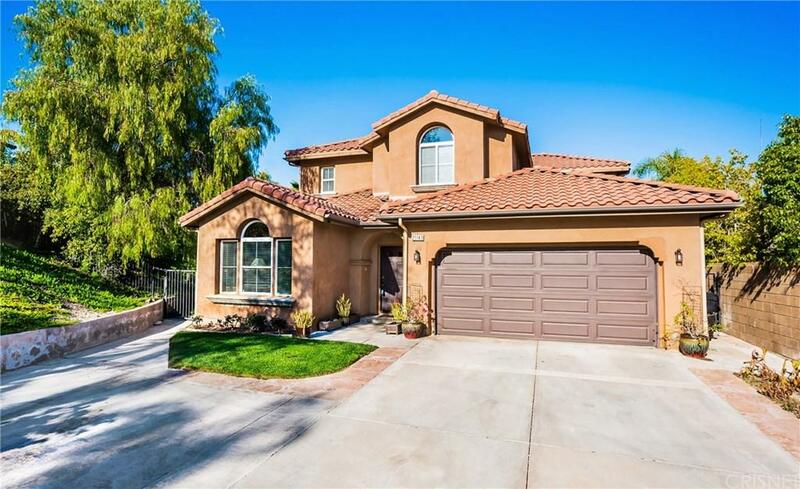 Waiting for that awesome Stevenson Ranch pool home with a large yard that is totally & tastefully remodeled? This beauty sits privately off the road. As such, there is extra parking & your own special sense of seclusion. All 3 full baths have been redone in the latest finishes. Wood floors throughout. Awesome granite kitchen with newer stainless appliances & huge walk-in pantry. New crown & base molding plus LED lighting. Gorgeous Pebble Tech pool/spa with fire-pit, stamped concrete hardscape and mature trees surrounding you which create they privacy that homeowner's love but is hard to find in Stevenson Ranch. The master is impeccable with the bath done in custom tile and the large walk-in closet is exceptionally well done with built-ins. There are 2 bedrooms down (one used as a gym) and 3 bedrooms up plus a tech center. 2-car garage with bench & cabinets. Walk to award-winning Pico Canyon Elementary! Tremendous pride of ownership!